It's been a while since I posted a new blog, so here goes nothing. 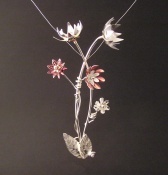 I've been starting new classes at the Currier Museum Art Center in Manchester, NH and at Metalwerx in Waltham, MA. Now I'm writing up class proposals and workshop proposals for spring and summer, so check my Workshops section on my www.joyraskin.com site to see where I'm teaching. I'm gonna offer small-scale welding workshops so that people can try welding right at their jewelry bench without needing large welding equipment. I've decided to try Etsy to sell, so you can find me as "spoonlady" as my Etsy shop. As for artwork, I've made a few more hedgie birds from welded nails, and doing custom work for clients. In between all that, I struggle to keep Mother Nature at bay, shoveling more snow than I care to remember. Today was a snowy day, followed by icy rains. Not the most ideal conditons. My dog does not like the rain! It's fun to watch him do his best to avoid getting wet. Now, if I can train him to help me work in my studio, that would be great. Here's a picture of a flower brooch I made for an exhibit opening on Friday Feb 6 at Gallery 205, 205 N. Main St, Concord, NH. For those who are weary of winter, this flower brooch will remind you of spring when the flowers start blooming. Spring is not that far away!